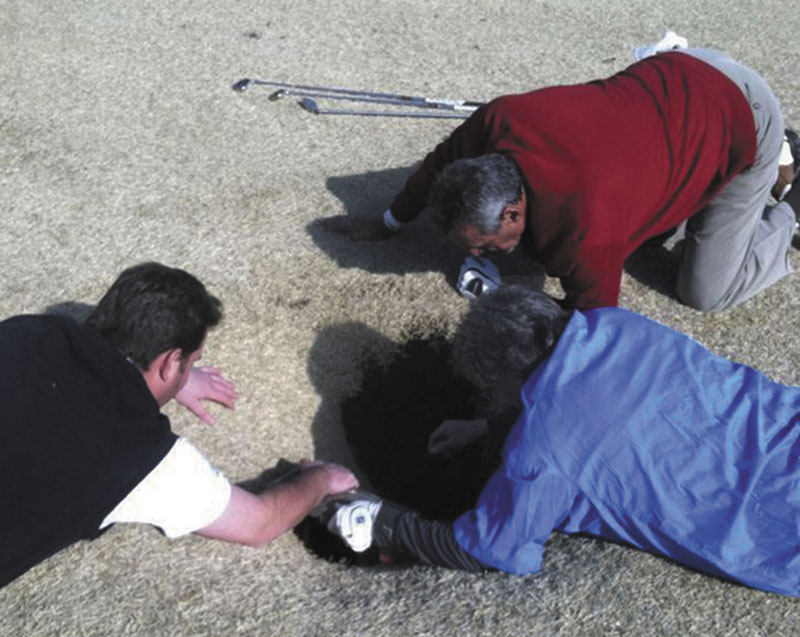 A 43-year-old mortgage broker was counting his blessings Tuesday and nursing a dislocated shoulder sustained four days earlier when he tumbled into an 18-foot deep sinkhole on the 14th hole of the Annbriar Golf Club near Waterloo, Ill., just southeast of St. Louis. ST. LOUIS — Suddenly being swallowed up by the earth on a golf course’s fairway drove a wedge between Mark Mihal and a stellar round. Friends managed to hoist Mihal to safety with a rope after about 20 minutes. But the experience gave him quite a fright, particularly following the much-publicized recent death of a man in Florida who died when his bedroom fell into a sinkhole. That man’s body hasn’t been found. His golfing buddies didn’t see him vanish into the earth but noticed he wasn’t visible, figuring he had tripped and fallen out of sight down a hill. But one of them heard Mihal’s moans and went to investigate. Getting panicky and knowing his shoulder “was busted,” Mihal assessed his dilemma in pitch darkness as he rested on a mound of mud, wondering if the ground would give way more and send him deeper into the pit that was 10-feet wide at the opening, then broadened out into the shape of a bell below the surface. A ladder that was hustled to the scene was too short, and Mihal’s damaged shoulder crimped his ability to climb. “At some point, I said, ‘I need to get out of here. Now,’ ” Mihal recalled. “I felt fortunate I didn’t break both legs, or worse,” Mihal said. While disturbing, such sink-holes aren’t uncommon in southwestern Illinois, where old underground mines frequently cause the earth to settle. In Mihal’s case, the sinkhole’s culprit was subsurface limestone that dissolves from acidic rainwater, snowmelt and carbon dioxide, eventually causing the ground to collapse, said Sam Panno, a senior geochemist with the Illinois State Geological Survey. That region “is riddled with sinkholes,” with as many as 15,000 recorded, Panno said. There’s no mention of its newest — and most challenging — hole.